The three-row X7 isn’t just a bigger BMW SUV, it’s a better one. 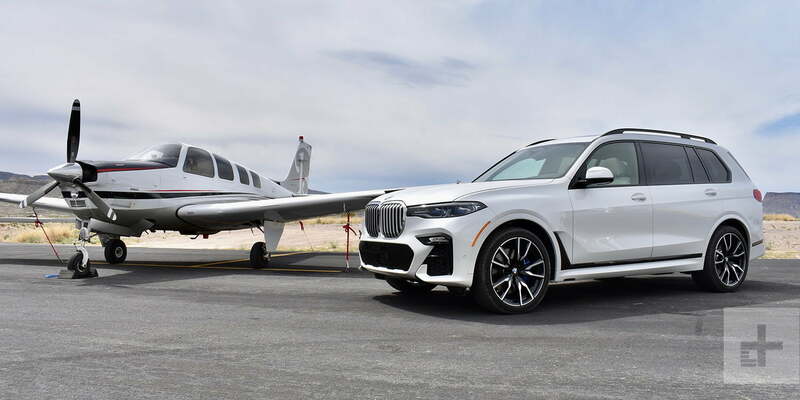 The popular saying proclaims that “everything’s bigger in Texas,” so what better place to test BMW’s biggest SUV to date? 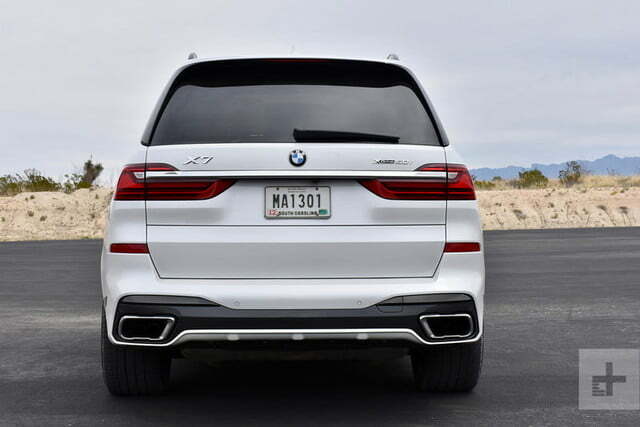 The 2019 BMW X7 is the Bavarian automaker’s first entry into the popular full-size luxury SUV segment. 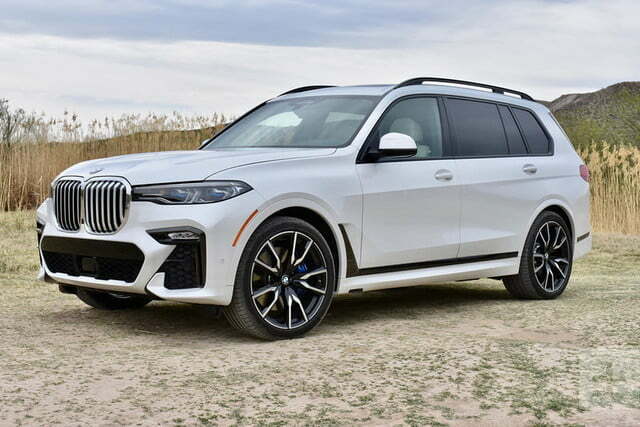 BMW was tired of sitting on the sidelines while the Mercedes-Benz GLS and Land Rover Range Rover raked in sales, so it finally pulled the trigger on an SUV a size above the X5. Built in Spartanburg, South Carolina, the X7 is available in two flavors, distinguished by what’s under the hood. 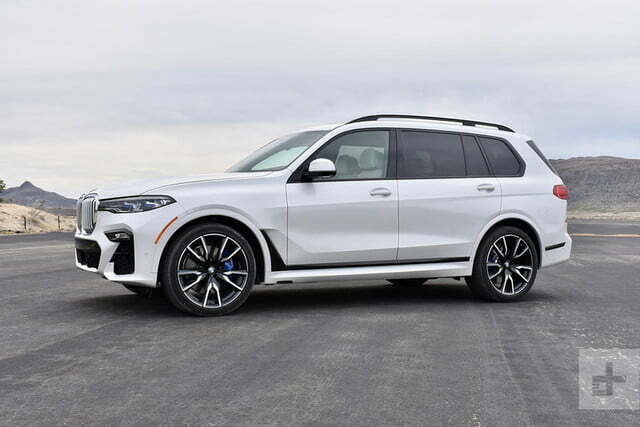 The base xDrive40i has a 3.0-liter twin-turbocharged inline-six engine and starts at $74,895, while the xDrive50i has a 4.4-liter twin-turbo V8, and starts at $93,595 (both prices include a mandatory $995 destination charge). We tested both versions during a drive across Texas. Like most current BMWs (the i3 and i8 being notable exceptions), the X7 has a handsome but conservative design. The only standout element is a massive grille that dominates the front end. 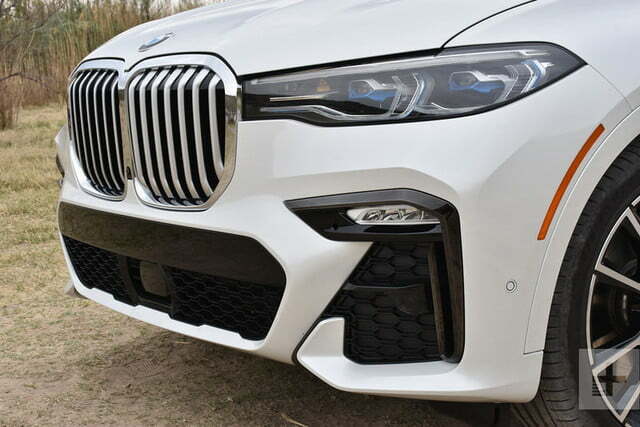 It’s not a very subtle form of brand identification, but Jörg Wunder, project manager for the X7, told Digital Trends that it’s scaled to the size of the car. There is indeed a lot of space on that front end, as evidenced by the number of dead bugs covering it after couple of hours of driving. 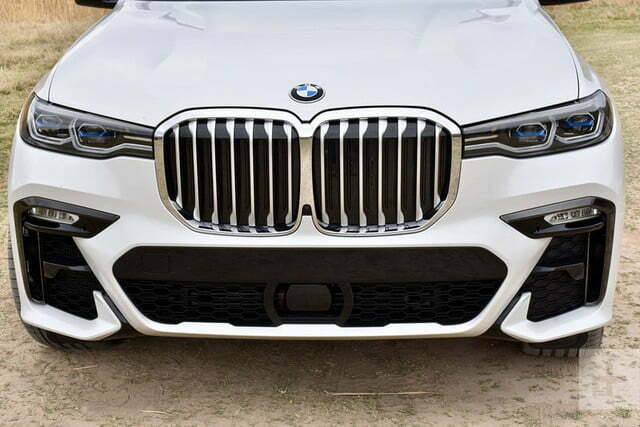 Plenty of other vehicles have giant grilles too, Wunder noted, claiming the X7 will look normal in traffic. 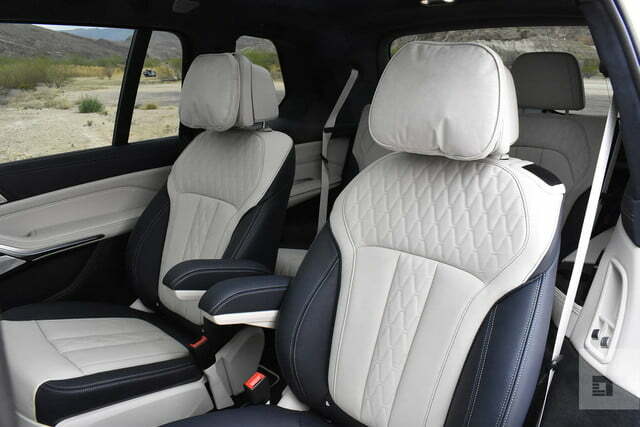 For an SUV like the X7, interior packaging is more important than exterior design. The boxy exterior yields a spacious interior, available in six- or seven-seater configurations. A two-seat third row is standard, but buyers have the option for a three-seat second-row bench, or individual captain’s chairs. 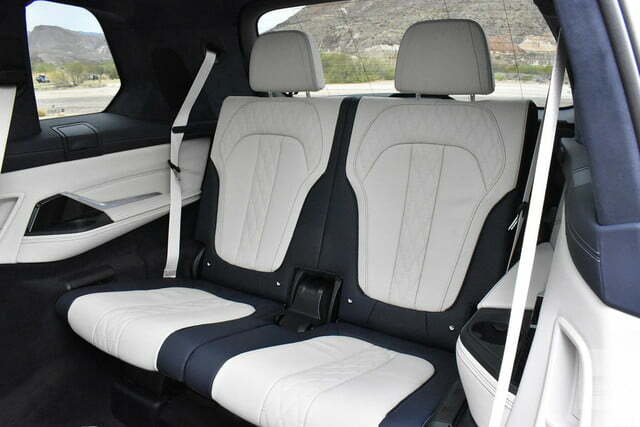 In most three-row vehicles, the back seats are the last place anyone wants to be. 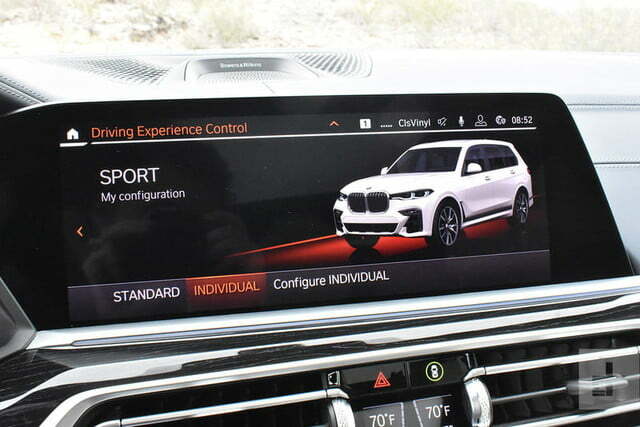 BMW tried to make the experience more pleasurable. The third-row seats are close to the middle of the vehicle, which was meant to give occupants a clearer view to the front. This setup creates a major blind spot for the driver, however. 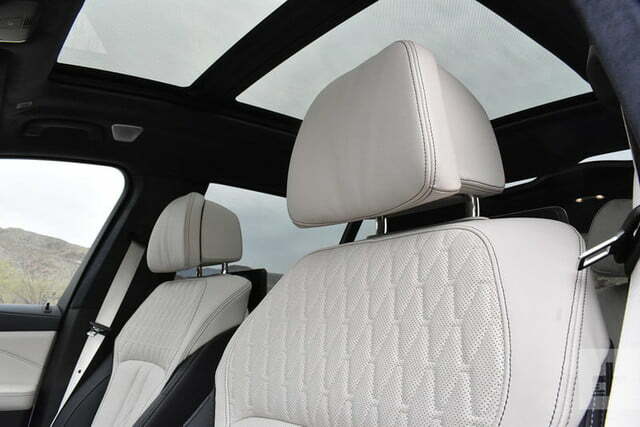 Rear-seat occupants also get their own sunroof and climate-control panel. We found the rear seats to be reasonably comfortable for a medium-sized adult, but taller people may not find them as enjoyable. Third-row space also seems to have come at the cost of second-row legroom, which we expected more of in such a large vehicle. 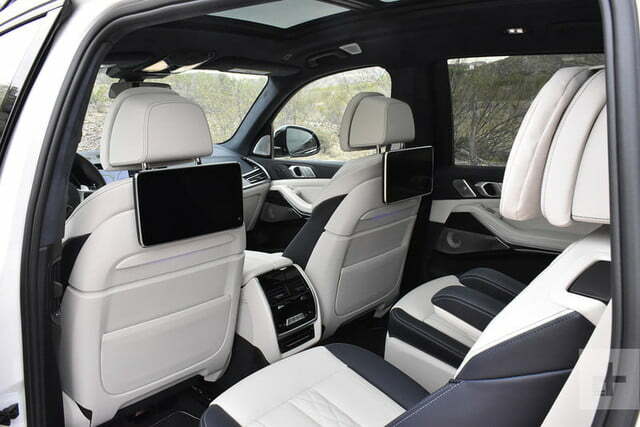 The X7 aims to be a luxury jet for the road, but that legroom felt economy-class tight. 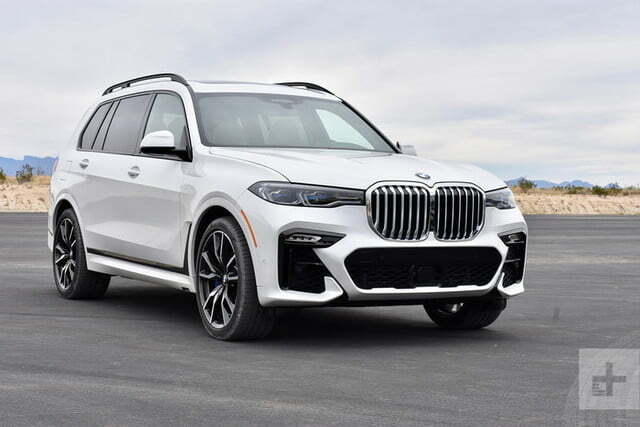 BMW did not provide passenger space measurements for the X7, but it did say that the SUV has 48.6 cubic feet of cargo space with the third-seats folded, and 90.4 cubic feet with both the second and third rows folded. The Mercedes-Benz GLS has slightly more space, at 49.4 cubic feet (third row down) and 93.8 cubic feet (second and third rows down). With all three rows in place, neither German SUV has a particularly capacious cargo hold. The Land Rover Range Rover is only available with two rows of seats, and has substantially less cargo space than the BMW and Mercedes. Like the Range Rover, the X7 has a split-opening tailgate that makes loading and unloading easier, as does the standard air suspension, which allows the X7 to kneel like a city bus. Up front, the driver gets a thick-rimmed steering wheel that feels like it belongs in an M5, not a school bus like the X7. 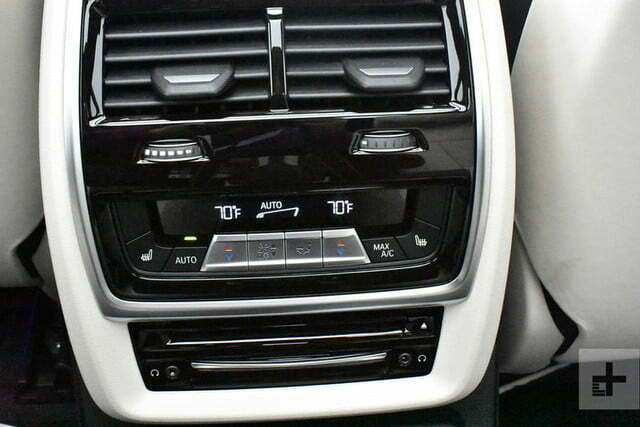 Front seats are available with heating, ventilation, and massage, which is par for the course for the segment. The dashboard’s horizontal layout is typical BMW, and a refreshing change from rivals that seem obsessed with covering every square inch with touchscreens. 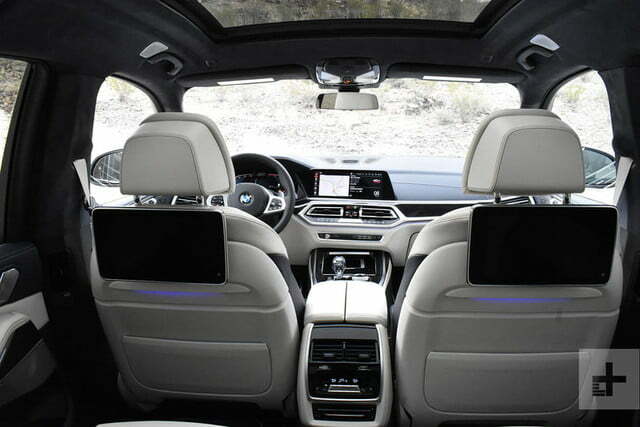 BMW strategically placed the X7’s 12.3-inch central touchscreen close to the driver’s line of sight, and the iDrive controller makes flipping through menus easy. The driver also gets a 12.3-inch digital instrument cluster. Now in its seventh generation, the iDrive infotainment system is compatible with Apple CarPlay, but not Android Auto. 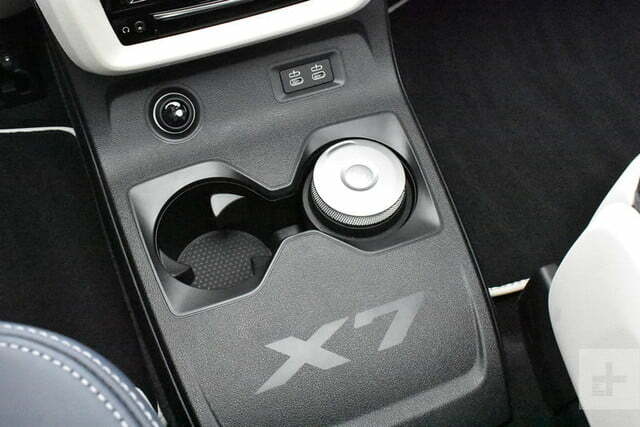 The X7 features six USB ports – two for each row – and wireless phone charging and WiFi are both standard. 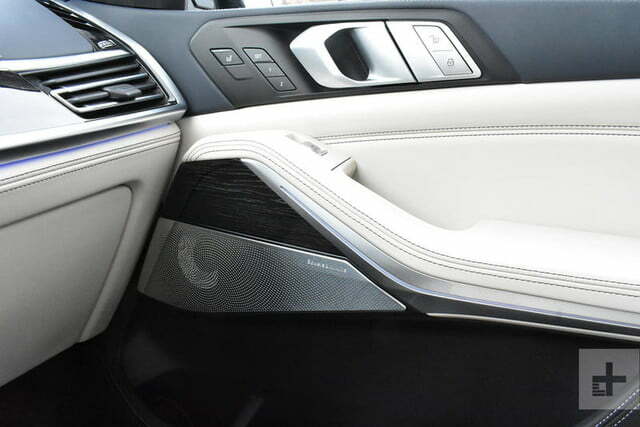 An optional rear seat entertainment system places two 10.2-inch touchscreens on the backs of the front seats. 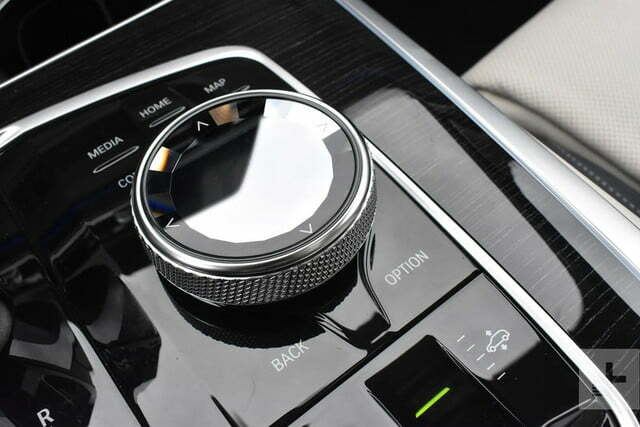 The X7 also has the gesture-control feature introduced on the BMW 7 Series sedan, allowing the driver to, for example, adjust audio volume with the twirl of a finger. It’s a feature that’s unique in the X7’s segment. It was a bit more reliable than when we first encountered it in the 7 Series, but if you are the kind of person who talks with your hands, you may get some inadvertent volume adjustments. 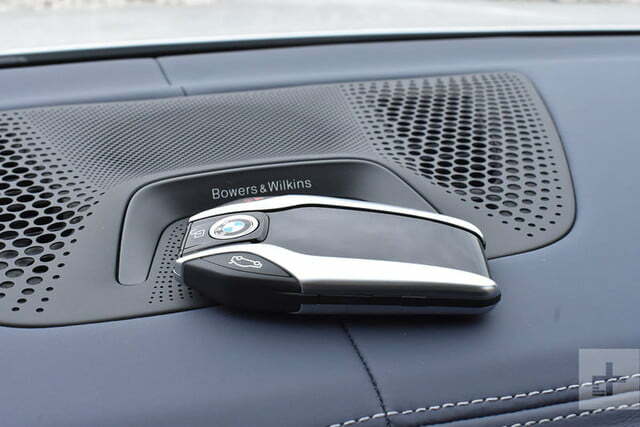 Speaking of the audio system, the optional Bowers & Wilkins surround-sound system offers impressive power and clarity, which is exactly what you’d expect from a system with 1,500 watts powering 20 speakers. 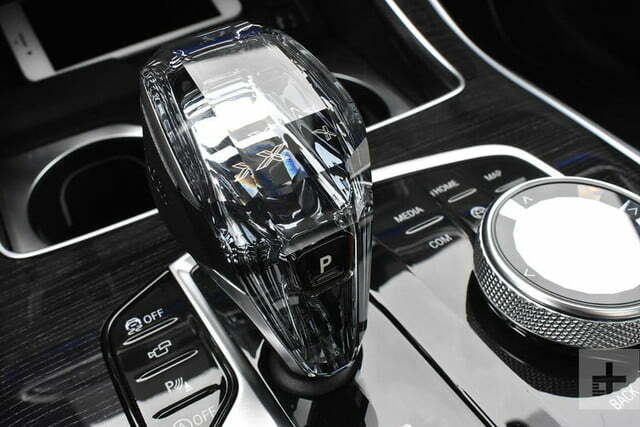 A 10-speaker, 205-watt system is standard on the xDrive40i; a mid-level Harman Kardon system is optional on that model and standard on the xDrive50i. 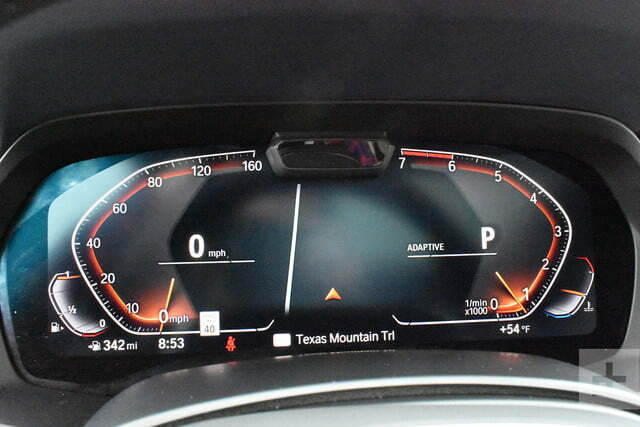 BMW installed a camera in the gauge cluster that reads facial expressions to detect distraction or fatigue. 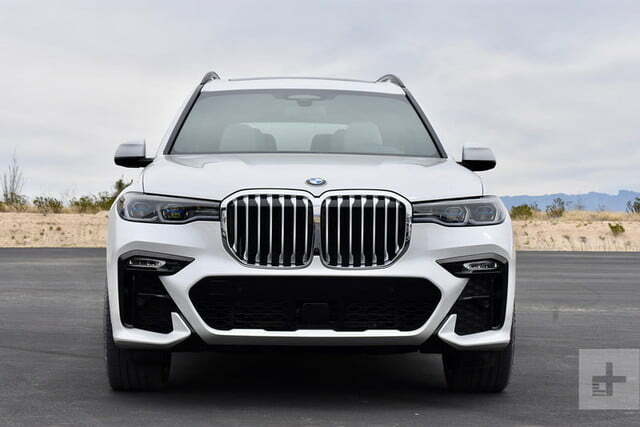 The X7 features adaptive cruise control and lane-keep assist, which allows the SUV to execute a lane change with the flick of a turn-signal stalk. Both features worked well on a long stretch of highway outside San Antonio, Texas. Lane-keep assist kept the X7 rock steady, and the adaptive cruise control accelerated and decelerated smoothly. 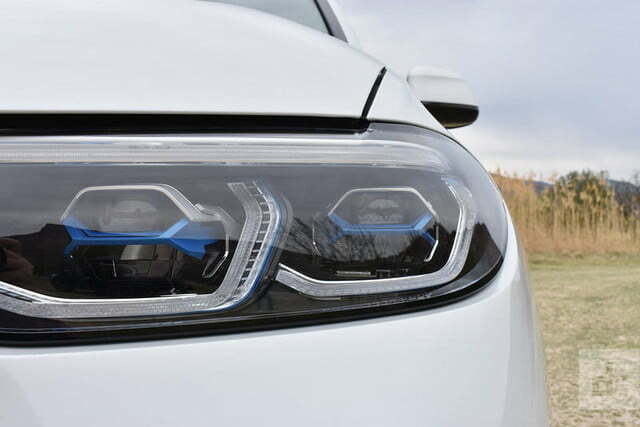 But these features still require the driver to be attentive at all times, so BMW installed a camera in the gauge cluster that reads facial expressions to detect distraction or fatigue. It may seem Orwellian, but it’s likely necessary to ensure drivers don’t get lulled into a false sense of security by the clever driver aids. Off the highway, the X7 can use “backup assist” to back itself out of tight driveways or one-way streets for up to 50 yards. BMW invited us to try it out on some closed-off tarmac at an airport. The system was able to maneuver the X7 around a parked airplane, but when we tried to reverse between two parked semi trucks, a near brush with one of them forced us to abort the operation. We drove the X7 hundreds of miles from San Antonio to El Paso, Texas, over three days, and the big SUV was well suited to the job. It was as comfortable and luxurious as a vehicle in this price range should be, but also entertaining enough to keep boredom at bay. Whether it’s a six-cylinder “40i” or eight-cylinder “50i,” the X7 gets an eight-speed automatic transmission and all-wheel drive (xDrive in BMW-speak). Both models are electronically limited to 130 mph. The xDrive40i model’s 3.0-liter twin-turbo inline-six produces 335 horsepower and 330 pound-feet of torque, which will get it from zero to 60 mph in 5.8 seconds, according to BMW. 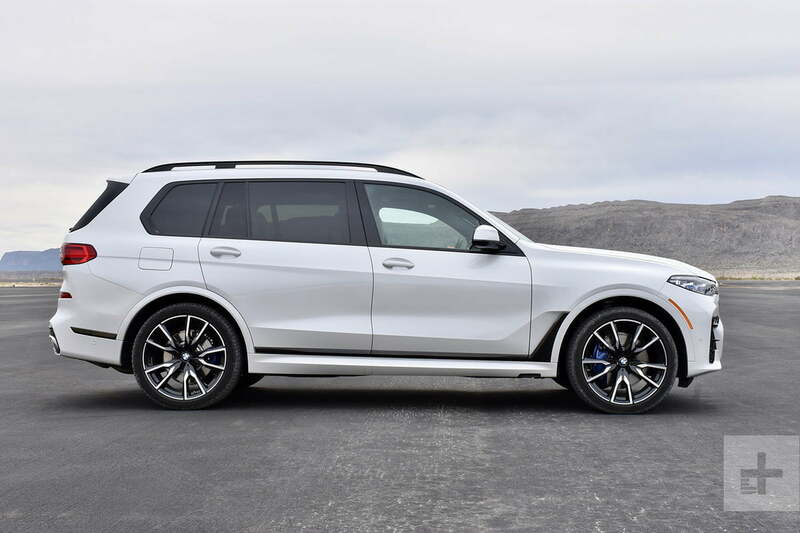 That’s quicker than a 3.0-liter twin-turbo V6 Mercedes-Benz GLS450, or a Range Rover equipped with the base 3.0-liter supercharged V6. 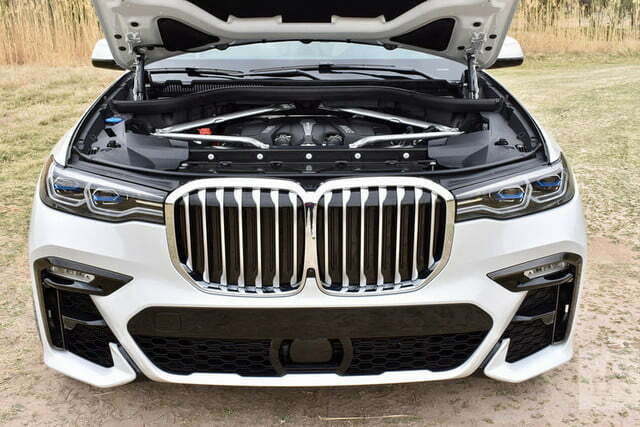 Upgrade to the X7 xDrive50i, and you get a 4.4-liter twin-turbo V8 churning out 456 hp and 579 lb-ft of torque. Zero to 60 mph takes 5.2 seconds, according to BMW. Both the 4.7-liter twin-turbocharged V8 Mercedes-Benz GLS550 and 5.0-liter supercharged V8 version of the Range Rover will match that. Mercedes also offers an AMG GLS63 performance model, packing 577 hp and the ability to do zero to 60 mph in 4.5 seconds. 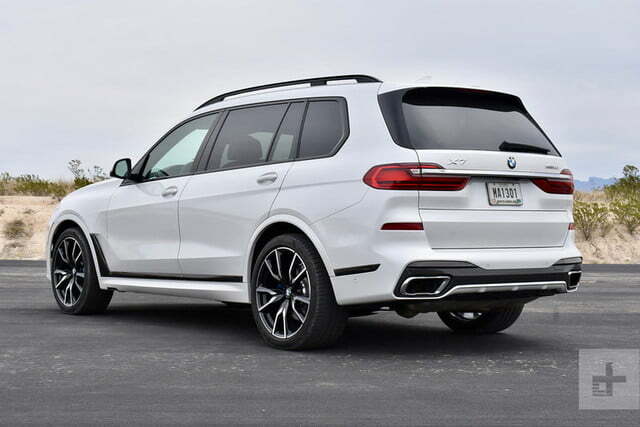 BMW’s famous tagline is “The Ultimate Driving Machine,” but the X7 has a more laid-back attitude. On the road, the X7 felt as quick as those numbers suggest. Even the inline-six was more than up to the task of moving this massive vehicle through traffic, while the V8 adds a nice growl that will have your neighbors thinking “muscle car” not “family hauler.” Handling is amazingly precise for such a big vehicle, although the X7 definitely feels more comfortable cruising along a highway than being hustled down a winding road. BMW’s famous tagline is “The Ultimate Driving Machine,” but the X7 has a more laid-back attitude. BMW did such a good job quieting wind and tire noise that a passenger in the third row can converse with the driver without shouting. The standard air suspension, which features a clever active roll stabilization feature designed to reign in body roll without ruining the ride, does a good job of soaking up bumps. However, we would’ve liked to see more differentiation between the Comfort and Sport settings. Official EPA fuel-economy figures are 22 mpg combined (20 mpg city, 25 mpg highway) for the xDrive40i and 17 mpg combined (15 mpg city, 21 mpg highway) for the xDrive50i. Both BMW models beat their Mercedes GLS counterparts, but Land Rover offers a diesel version of the Range Rover that offers superior fuel efficiency of 24 mpg combined (22 mpg city, 28 mpg highway), and it’s bringing out a plug-in hybrid as well. 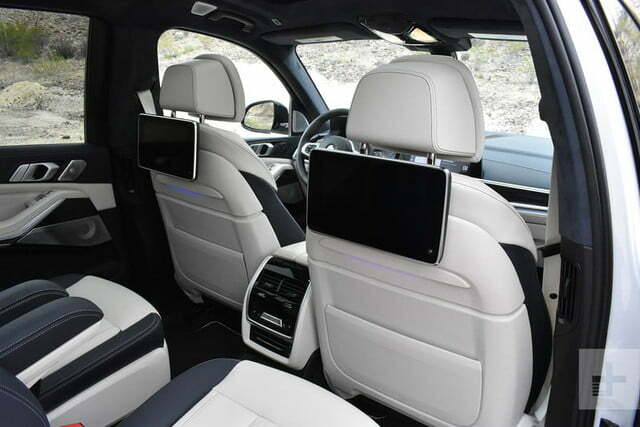 The BMW X7’s two main rivals are the Land Rover Range Rover and Mercedes-Benz GLS. Other manufacturers make similarly-sized luxury SUVs, but these two are the best of the bunch. Land Rover Range Rover (base price: $90,155): The Range Rover’s starting price is closer to the top X7 xDrive50i than the base xDrive40i, and that’s not the only issue. 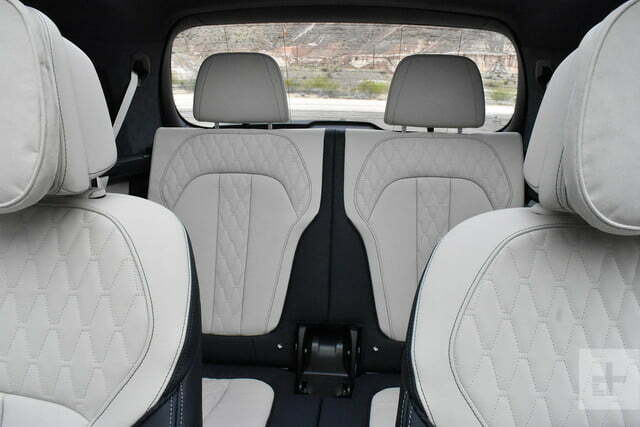 The Land Rover is only available with two rows of seats, and the BMW has a better infotainment system. But the Range Rover does offer Android Auto, has genuine off-road capability, and is just plain cooler than the X7. BMW is trying to enter a market segment Land Rover created. Tell people you drive a Range Rover, and no further explanation is needed. That won’t necessarily be the case with the X7. Mercedes-Benz GLS (base price: $71,145): The X7 is closer in concept to the GLS. Both are seven-seat SUVs designed primarily for on-road driving, with similar base prices. We think BMW’s infotainment system is easier to use than Mercedes’, and the X7 variants better or match the performance of comparable GLS models while achieving superior fuel economy. 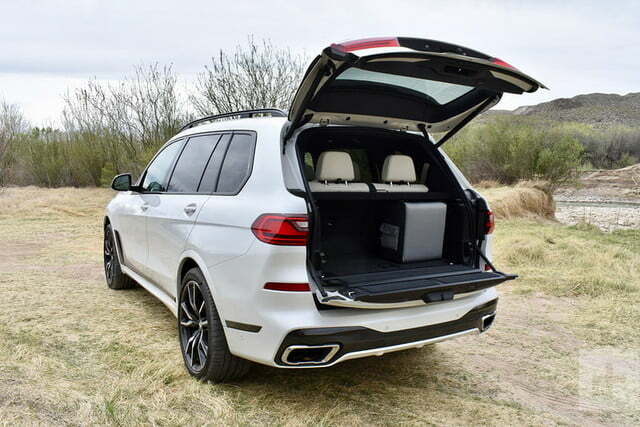 But Mercedes offers more cargo space, and the fire breathing AMG GLS63 performance model. BMW offers a four-year/50,000-mile new car warranty, as well as three years of complimentary scheduled maintenance. The warranty terms are fairly standard for the luxury segment, but some competitors don’t match BMW’s free maintenance term. The X7 is a new model, so predicting future reliability is difficult. 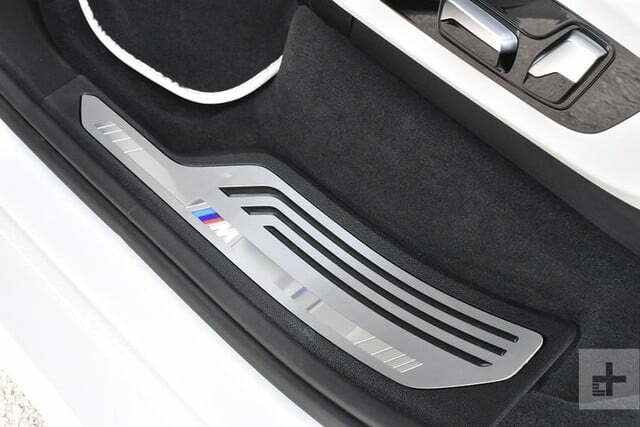 We would start with an xDrive50i to take advantage of the V8 engine’s extra power. 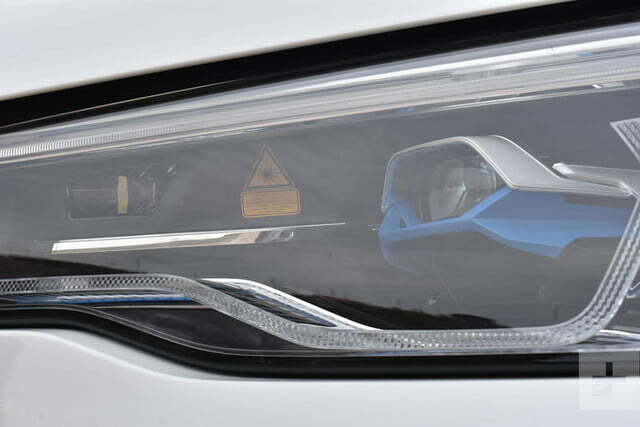 This model also includes standard features – like a head-up display, leather upholstery, and 360-degree camera system – that are optional extras on the base xDrive40i. 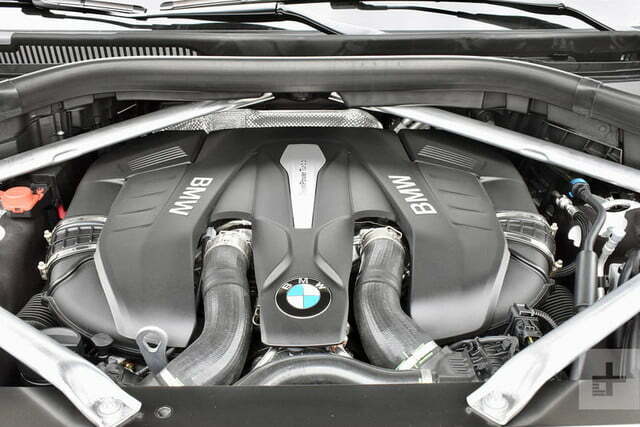 We would then add the M Sport Package ($3,550) to get the sport exhaust system in order to better hear the V8’s rumble, as well as the dynamic handling package ($4,750). It adds upgraded brakes and an M Sport differential to better take advantage of the engine’s power. We would also check boxes for the cold weather package (which adds five-zone climate control plus heated seats, front armrests, and steering wheel for $1,200), and the top-spec Bowers & Wilkins audio system ($3,400). 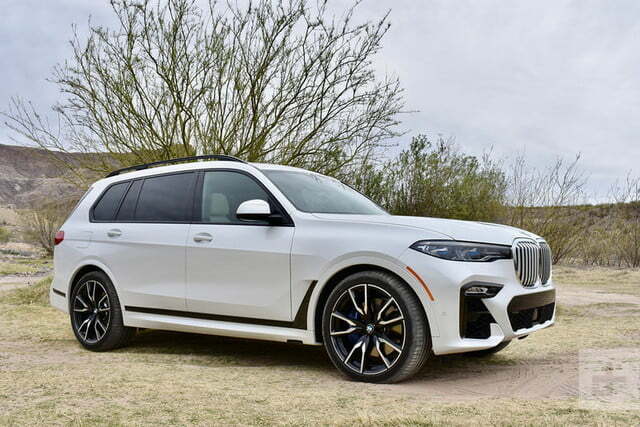 It is surprising BMW took so long to build the X7. An SUV with the DNA of BMW’s smaller models, plus three rows of seats, always made sense. Now we can confirm that the finished product is worth the wait, offering an excellent balance of practicality and luxury without forgetting the tech buyers seek.